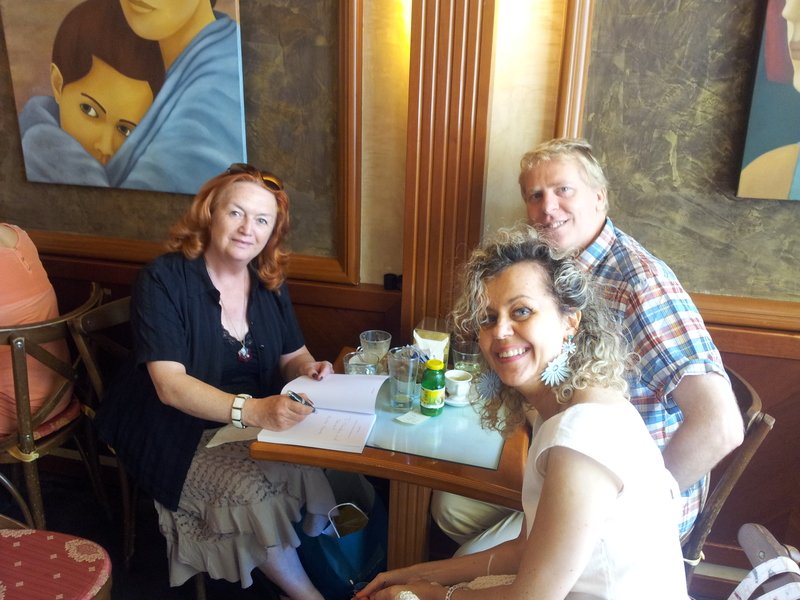 Impromptu book signing in Lucca! Finally we begin our two-week break from the office! Effectively, it began yesterday as we drove over to the lovely city of Lucca to meet special friends for lunch. We met for coffee in the Piazza San Michele and I was delighted to be handed a belated, and unexpected, birthday present all wrapped up in the traditional Italian way. Whilst in the cafe I found myself doing an impromptu book signing, which was very nice indeed! For lunch we went to Il Mecenatee at Via Del Fosso 94, very traditional and very nice. The conversation with our friends, he is Australian and she is Italian, ranged from baking English scones (she is a fantastic cake maker), writing books (he has recently written a science fiction novel), the next three most likely things to invest in, what is there today that we would love to see developed and produced over the next thirty years (we’ll probably be pushing up the daisies by then), my man and our Australian got into a very in-depth discussion about how many things today were influenced by the sixties science fiction films and books, and Australia. So, what about the next two weeks then? I could never have guessed how difficult it would be to plan nothing. Nothing seems to come in many different shapes and sizes. Well, we have two grandchildren and we don’t get to see them often enough. Our granddaughter age eight, will be with us for three days next week and she loves horses. So we’ll be off to visit an equestrian centre. Our grandson, age twelve, nearly thirteen, will join us for three days the following week and he loves sport, particularly rugby. So we will have to find something sporty to grab his attention. I must also crack on with additional research for ‘The Bolivian Connection’ which is my current novel. If you know of anyone who lived or worked in Bolivia any time between 1970 and 1995, I would love to interview them. What are you currently reading? I have just finished ‘Maggie, Her Fatal Legacy’ by the journalist John Sergeant. As a result, I have now just started reading Michael Heseltine’s autobiography ‘Life in the Jungle’ as he played such an important part in getting Maggie’s back up. It’s not that I am political, however, I do enjoy reading about strong personalities and what made them tick! Back at Laura’s bar/alimentari in Fiano, her daughter Bernadette has broken her foot! This means that poor Laura is working her own feet off without any help, so we have all been most understanding about her closing every afternoon and all day Sunday. Thursday was Ferragosta, the traditional August ‘bank’ holiday and the start of a two-week break for most Tuscans and whilst one newspaper reported that six out of ten shops are remaining open (due to the failing economy) we do not expect to find that many doing so in our area. 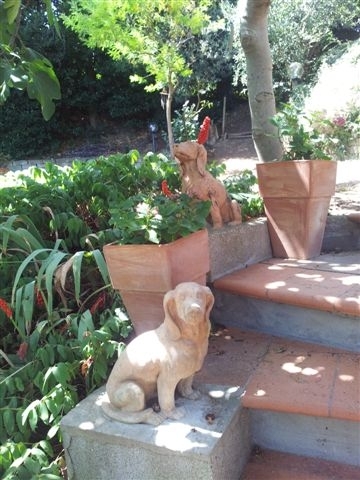 Terracotta dogs guarding the steps to the orchard. My man continues his early morning watering of the garden and, ignoring the dusty brown ‘lawn’, it is looking very beautiful. Farty Barty the cat is putting on weight, which is a sure sign that the summer, like the days, is starting to get shorter. Our peppers are just starting to turn red on the plants and we have had a reasonable crop of tomatoes. My man came in with some big fat oranges from the orchard this morning and we have noticed some new baby lemons on our potted lemon trees. 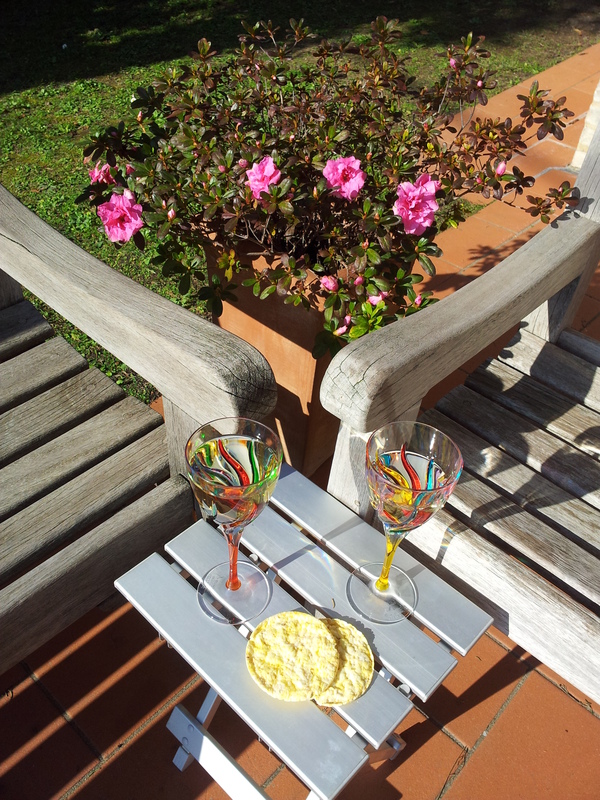 Well enough of that, time to think about our first aperitivo of the holiday. However, the grumpy man has given up drinking again, except when we go out to a ristorante. However, he is to be congratulated and I must stop being a bad influence. But then again, we have a cantina full of Chianti…….! PS Don’t forget to check out http://www.firstchapters.net for your holiday reading. I have heard very good reviews about ‘My Father, The Assassin’ by J W Finnigan. Thank you for your kind words and it is always very gratifying to know that readers do enjoy my blogs. The hills & mountains north of Lucca are very popular for English speaking Expats that include a lot of writers and artists. But this does not spoil Lucca in any way, which you may wish to visit out of season to avoid the crowds. We live about an hour and a half further inland near Certaldo, in the hills. This area also has many writers and artists, however, many are Italians. We are surrounded by very talented people including musicians and these hills are often alive with the sound of music. We love it! It sounds like your ‘nothing’ holiday will be filling up with the unexpected which is always nice. I am currently reading Christ stopped at Eboli by Carlo Lei and really enjoying it, I can’t remember the last time I had so much spare time! Relax, unwind and enjoy some of your Chianti! Still not completely relaxed, however, my man wants to join me with an aperitivo thank god!